PARIS--According to Toyota Motor Philippines' first vice president for vehicle sales, Raymond Rodriguez, exactly one unit of the very exotic Lexus LFA sports coupe will make its way to the Philippines. Lexus will only assemble a total of 500 units of the extremely exclusive two-seater, and many countries have only gotten an allocation of just one unit. The unit earmarked for the Philippines will be snapped up not by a private customer but by TMP itself, said Rodriguez on the eve of the opening of the Paris Motor Show. The unit, shared Rodriguez, will be used for Lexus Manila's marketing initiatives and eventually parked at Lexus's lone showroom in the country, located at The Fort Global City in Taguig. So why did TMP decide to buy the unit itself? "It will be very expensive for a private buyer," explained Rodriguez. "The car sells for around $400,000 in the US. After taxes, it will cost double that amount in our market, bringing its price tag to P40 million." While the LFA is almost always seen with a white paint job in official press photos, Rodriguez pointed out that it's actually available in various other colors. "You can, in fact, choose the color that you want. You can personalize it and specify swaths of cabin materials. No two LFAs will be identical." And what color is TMP’s LFA going to be in? "Red," revealed Rodriguez. The unit could make it to Manila as early as January 2011. What if a really wealthy Filipino car enthusiast takes interest in the car? "We'd probably consider selling it in the future," Rodriguez said. "But in the meantime, we'd like to keep it first and use it to serve as a halo car for the Lexus brand." 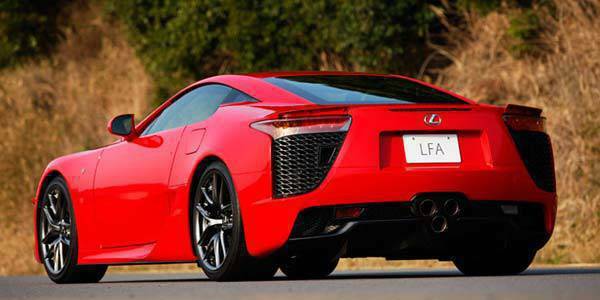 UPDATE: According to Lexus Manila president Danny Isla, they placed an order for a white LFA unit, not red. Said unit will have a "black-and-red interior trim."